I’m not sure if this belongs in Miscellany, Decor, Gifts or Stationery. So let’s pop it in all four. There a reams of photographs out there of brilliant, romantic, funny and quirky wedding signs. Whether you’re buying one for yourself or buying one for the married couple, some of the best examples are hunted for you below. Wedding signs can be functional … but that doesn’t mean they can’t also look good and fit the theme of the day, as this example via Style Me Pretty shows. A popular idea is to have the young attendants announcing the bride’s arrival with a “Here Comes the Bride” sign. This version, via Martha Stewart, has a delightful home-made quality to it. Or, you could create a sign for your guests to wave during the ceremony, like this absolutely fantastic “Yay” flag idea [ image : Jesi Haack Design ]. These send-off flags seem to be springing up everywhere – like these endearing ones via Etsy. Perhaps nicer than pelting the Bride & Groom with rice? There are a wide range of examples out there of couples adorning their chair backs. I’m a particular fan of this message above. Would have been appropriate for my own wedding [ image : Pinterest ]. This Mr & Mrs sign via Through the Cottage Door would make a lovely gift for the happy couple. This rope creation is a clever material for a “Just Hitched” message [ image : Tumblr ]. Now we come to the freestyle section. Messages written in any medium on any item. Just find some fitting words and leave in an appropriate place for your guests to find [ image : Green Wedding Shoes ]. 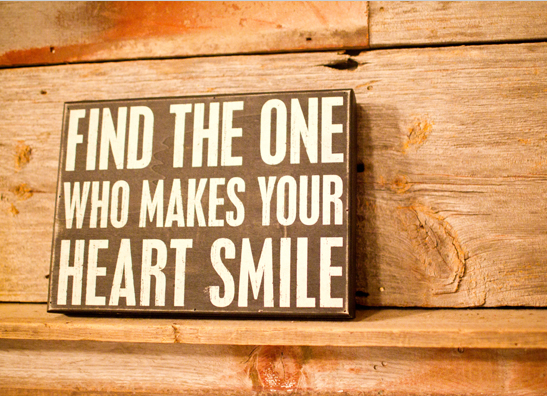 And you can’t deny the sentiments of this fairytale wooden sign via those craft folk at Etsy. It’s also the perfect rounding off message … what can possibly follow this? Have you seen any brilliant wedding signs?